The T25 was developed on the basis of the T23 medium tank, but was never manufactured. In one respect, due to it's very nice gun depression, the tank makes an excellent hill shooter. On maps defined by their hilly terrain that can be driven up and shot over, the T25AT thanks in part to it's powerful engine, has no problem climbing these hills to quickly pop over and shoot with it's gun aimed full down. Once more, while the tank does well in this regard, it unfortunately means exposing itself to enemy fire that if the driver isn't quick enough. PS: After receiving a buff in Update 3.7, the frontal armor thickness was increased tremendously to 120 mm. 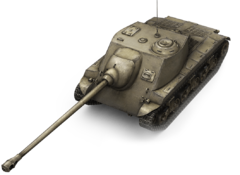 Combined with the angling, the front will have 160 mm of effective armor, which means same tier light and medium tanks have a 50/50 chance of penetrating (with the exception of the German Panther). When hull-down and utilizing the full 10 degrees of gun depression, the effective armor thickness goes up to nearly 200 mm, meaning all tier 7 tanks (with the exception of a few TDs) have a 50/50 chance of penetrating. Of course, the opponents could easily switch to gold rounds to take you down, so don't rely on the frontal armor too much, even if it is much more reliable now. As a trade off the weight of the tank was increased by 1 ton, which affects the acceleration a little bit, but should be negligible. Finish by researching the upgraded suspension. This page was last modified on 25 April 2017, at 14:59.